The SSF Pro Academy U8B team competed in the 2016 Westmont Yard Travel Soccer Session U08B championship game on 19 March 2016. Led by Coach Lorin Spasovici, the SSF U8B team defeated West Lawn SC 5-1 in the semifinals before completing their postseason run with a closely fought 1-2 loss to USA U8 Liverpool in the championship game. 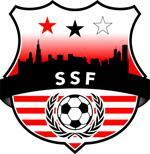 The SSF U8B team finished second in their division with a sterling 6-2-2 record. ©2019 South Side Fire FC / SportsEngine. All Rights Reserved.